Photographing ﬁreworks is easier than you might think. Whether you’re watching a Guy Fawkes display, attending a wedding or celebrating New Year's Eve, following these guidelines when setting up and shooting will help you get fantastic results. You’ll also learn a great trick for shooting in Bulb mode that will allow you to feature bursts of multiple ﬁreworks in one amazing shot. A great photo of a burst of multicolored ﬁreworks exploding in sync looks impressive in any portfolio. It’s impossible not to be tempted to snap away during a display when sparklers, bonﬁres and Catherine wheels light up the night. But without the right settings, photos can end up looking blurry or smoky. Luckily, a bit of planning and technique is all that’s necessary to learn how to get some really stunning ﬁnal images. Trying to shoot displays that only last a few minutes can be chaotic in the middle of an excited crowd, so turn up early to scope out the location and ﬁnd a good place to set everything up. Chat to the ﬁreworks technicians if they are available when you arrive – they can keep you up to date on when and where to expect the action. 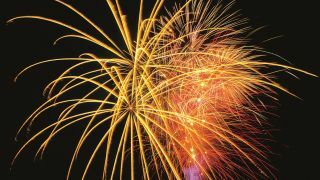 You’ll need to pack a tripod to keep things steady, as using a long shutter speed is the key to great ﬁreworks photos. This will allow you to capture well-deﬁned trailing lines of light and different bursts of ﬁreworks in one dynamic picture. It’s also a good idea to pack a very low-tech bit of kit – black cardboard – as this will help you control the exposure. Have fun and soon you will be able to get images like the one below!